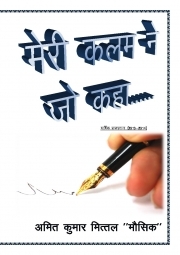 Description of "MERI KALAM NE JO KAHA ........"
Book is about life. It is about Joy and grief, difficulty and happiness in everyone's life. It is the story of every body but the way of telling is according to Author. It is a First Edition of Annual Summary called VARSHIK SAFARNAMA - means whatever author has written in a year, shares with this book. You can enjoy the book. Author Amit Kumar Mittal is basically a Law Graduate and in a Private Job. Writing is his passion. He has published a book earlier named - AAINA ..... Meri Navodit Panktiyan also. Reviews of "MERI KALAM NE JO KAHA ........"